Nearly every kid goes through a LEGO obsession phase -- much to the delight of parents who get to re-visit their own childhood hobby of assembling creations brick by brick. 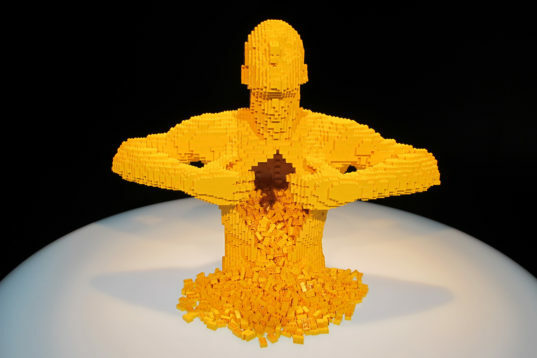 Artist Nathan Sawaya is living every kid's dream, as he has turned his affinity for LEGO into a creative, inspired profession, elevating the bricks to an art form. 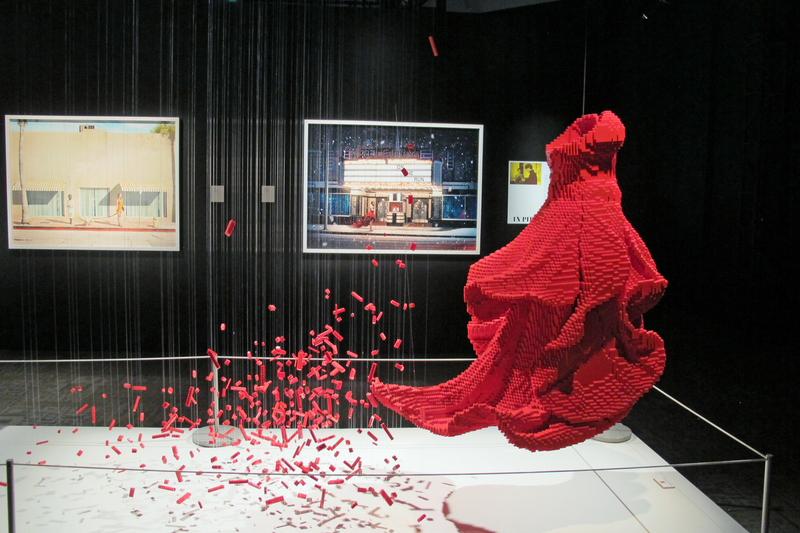 Sawaya's exhibit The Art of the Brick is currently on display at the Fleet Science Center in San Diego, and his spellbinding masterpieces, all comprised solely of LEGO bricks, are a sight to behold. Featuring over 100 works of art, from a 20 foot-long T-Rex dinosaur skeleton (made of 80,020 pieces -- one of Sawaya's largest sculptures ever) to Van Gogh's Starry Night, kids will at once be astounded, educated and inspired by each masterfully constructed sculpture. Sawaya offers, "The Art of the Brick takes LEGO somewhere you wouldn't expect and shows you things you have never seen before. The goal with this collection of art is to demonstrate the potential of imagination and the power of creativity." Click through our gallery for a glimpse at the exhibit, and read on to learn more about these playful sculptures. 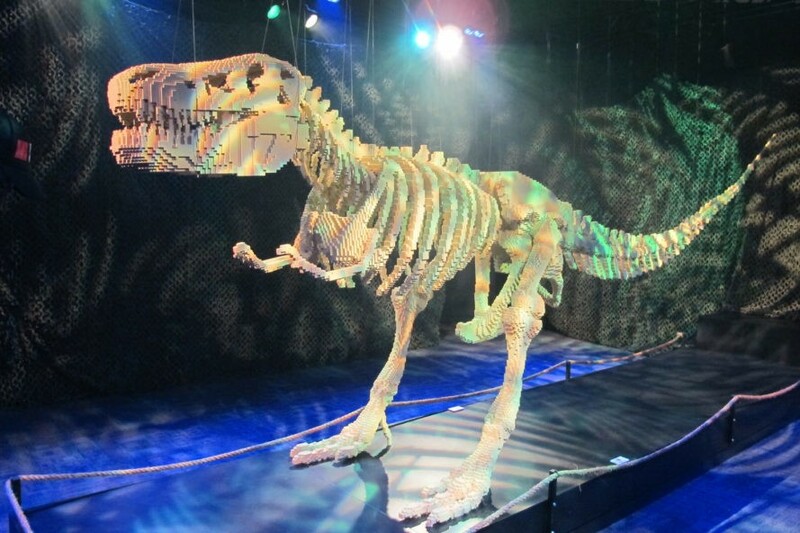 Kids and adults alike will be captivated at every turn of The Art of the Brick. Children who have never seen the famous artworks represented will have their interest piqued at the magical opportunity to learn via LEGO. With regard to re-creating renown art in brick form Sawaya explains, “I first learned adjectives through School House Rock. I learned how to count to ten through Sesame Street. I learned about gravity through my slinky. Imagine if a child learns about art history through LEGO!” For one portion of the exhibit, Sawaya teamed up with photographer Dean West on the collaboration IN PIECES, which features LEGO sculptures that replicate subjects shown in West’s photography. The LEGO red dress seen below was masterfully crafted to show curves and movement — no doubt a difficult feat given the sharp, defined edges of the toy bricks. Visitors will also get to see Sawaya’s street art “Hugman” sculptures, (below) which have been showcased in major cities around the world hugging sign posts, fence poles, trees and more. When Sawaya was asked to do an outdoor installation at Clement C. Moore Park in NYC, he used bricks that had been signed by guests at The Art of the Brick exhibitions to create his sculptures, which hugged park trees from April 17-May 16, 2014. My kids are LEGO fanatics, and they thoroughly enjoyed viewing Sawaya’s art, while demonstrating a deep appreciation and understanding of the complexity of the medium. Any kid who has tried to painstakingly piece together one of the larger LEGO sets to create the intended result will be in awe of the time and dedication it takes to build these works comprised of thousands upon thousands of bricks. The experience was one we’ll always remember. The Art of the Brick at the Fleet Science Center is on display now through January 29, 2017. Kids and adults alike will be captivated at every turn of The Art of the Brick. Children who have never seen the famous artworks represented will have their interest piqued at the magical opportunity to learn via LEGO. My kids are LEGO fanatics, and they thoroughly enjoyed viewing Sawaya's art, while demonstrating a deep appreciation and understanding of the complexity of the medium. These "Hugman" sculptures are Sawaya's street art, which has been showcased in major cities around the world hugging sign posts, fence poles, etc. 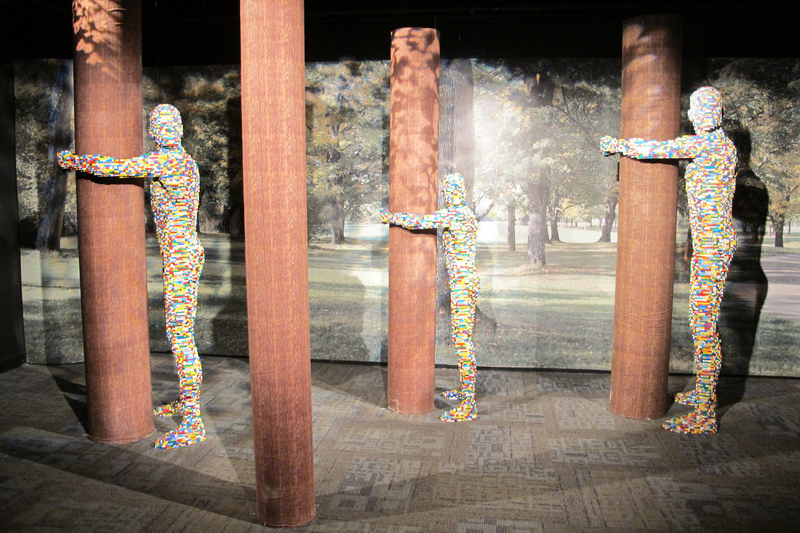 When Sawaya was asked to do an outdoor installation at Clement C. Moore Park in NYC, he used bricks that had been signed by guests at The Art of the Brick exhibitions to create his sculptures, which hugged park trees from April 17-May 16, 2014. My kids are LEGO fanatics, and they thoroughly enjoyed viewing Sawaya's art, while demonstrating a deep appreciation and understanding of the complexity of the medium. Any kid who has tried to painstakingly piece together one of the larger LEGO sets to create the intended result will be in awe of the time and dedication it takes to build these works comprised of thousands upon thousands of bricks. Sawaya teamed up with photographer Dean West on the collaboration IN PIECES which features LEGO sculptures that replicate subjects shown in West's photography. This LEGO red dress was masterfully crafted to show curves and movement -- no doubt a difficult feat given the sharp, defined edges of the toy bricks. Truly magnificent in stature, and what dedication to composition and texture. LEGO is the perfect medium to engage kids and teach them about famous art. Van Gogh's Starry Night in LEGO form by artist Nathan Sawaya.